Internet access is available in these condos in North Myrtle Beach, SC so bring your laptop computer and get online while you are here. Having access to restaurant menus, golf course information and store hours can be quite helpful as you plan your North Myrtle Beach vacation day and this Internet access allows for that. Another amenity in the condos at Beach Club II is the washing machine and clothes dryer. You can pack less for this North Myrtle Beach vacation, thereby giving you some more room in the car or fewer bags to check at the airport. When the washer/dryer unit is at your fingertips you can do some laundry with ease during your beach vacation. The oceanfront balcony steals the show in each of these North Myrtle Beach vacation rentals. Furnished so you can completely relax, the panoramic vistas from these oceanfront balconies are marvelous. 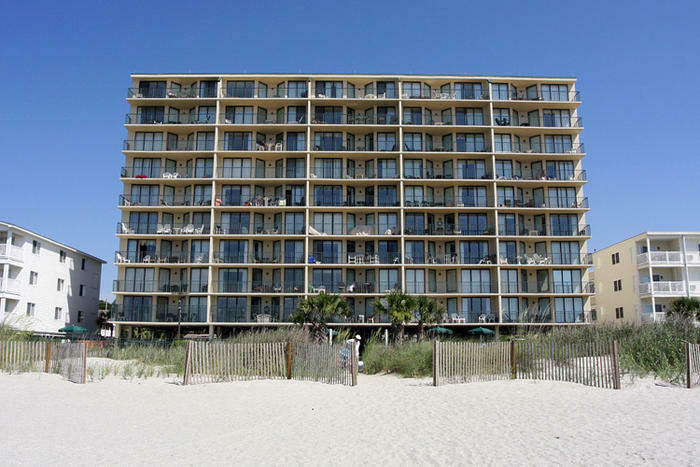 Listen to music or listen to the waves and seagulls while you enjoy a peaceful retreat to the balcony your Beach Club II North Myrtle Beach condo rental . From watching the sunrise early in the morning to watching the stars come out later in the evening, the oceanfront balcony is a wonderful vantage point for memorable North Myrtle Beach vacation events. Your family can see the swimming pool from the balcony, too. Beach Club II has an oceanfront swimming pool. Lounge chairs are lined up in the adjacent oceanfront lawn and invite you to take a load off and get some sun. When it gets a little warm, slip into the refreshing swimming pool and enjoy a lap or two under the Myrtle Beach sunshine. For more swimming options and a larger-than-life play area, venture out to the beachfront. The beach access from Beach Club II is right there. Cross the dune line and in no time at all you will be on the white sandy beaches. Take a beach chair to the water’s edge and let the incoming waves lap at your bare toes. Spread out a beach blanket and read a book while sporting new sunglasses and the latest in swimwear. Walk for miles and get some exercise or walk for just a few minutes and find seashells galore. The Atlantic Ocean is a fun place in which the whole family can swim. At high tide the waves are big and at low tide wading out to the sand bar can be a great idea. When you are in the mood for more adventure and amusements you can drive a few minutes in almost any direction from Beach Club II and find it. This North Myrtle Beach resort is closely located to amusement rides, the Myrtle Beach SkyWheel, championship golf courses, a zip line, shopping and more. Water parks with water slides, wave pools and children’s playgrounds are in the area and Family Kingdom is in Downtown Myrtle Beach, South Carolina, across the street from the Atlantic Ocean. The Myrtle Beach SkyWheel soars to great heights on the oceanfront and gives you an incredible view of the ocean and the Myrtle Beach landscape. There are more than 100 Myrtle Beach area golf courses. Golfers love the selection of golf courses available here and the ease in making tee times. Some golf courses are lighted for evening play and they all boast a clubhouse and pro shop. For those who aren’t quite ready for 18 holes of Myrtle Beach golf, you might opt for 18 holes of miniature golf as putt-putt golf courses are prevalent in the North Myrtle Beach area, too. Shopping is a sport in Myrtle Beach where Barefoot Landing, Broadway at the Beach, The Market Common and two outlet malls vie for your attention, in addition to three malls that are scattered from one end of the beach to the other. Bring your walking shoes because there are plenty of stores to visit during your North Myrtle Beach vacation. There are live entertainment theatres around town that feature daily musical productions that include singing, dancing, comedy and sometimes even animals. From the Carolina Opry and Alabama Theatre to Pirates Voyage and Medieval Times there is a show in town that the whole family will love.